Lulu and I have known each other for almost thirteen years now and recently bonded over our passion for female empowerment and living a beautiful, healthy lifestyle. Her love for Chinese herbs started at a young age; her grandfather ran a hospital in the Southern Chinese province of Hunan. While she spent the last decade working in management consulting and climbing the corporate ladder and loved the work, the unsustainable hours and lifestyle left her wanting to do something more purposeful and connected to her Chinese heritage. As she explored finding a new career, she discovered the use of Chinese herbs - especially a class of herbs known as adaptogens, which help naturally lower stress levels in the brain and rebalance the body, were on the rise. Unfortunately, most companies using adaptogens prioritized getting the lowest price, rather than focusing on the supply chain impacts and source of the herbs. This mentality hurts many of the indigenous communities in China whose livelihood depends on wild harvesting and sustainably growing these precious plants. Lulu spent this past summer traveling through remote, high elevation regions of China and meeting with different indigenous groups known for sustainably harvesting the highest quality herbs throughout the country. It was in the Tibetan-Qinghai Plateau that members of the Salar people, one of China’s 55 ethnic minorities, introduced her to this precious crop. While it's in the same family as the red goji berry more familiar in the West, the black goji is much more rare and has the potent antioxidant known as anthocyanin. The anthocyanin found in black gojis offers anti-inflammatory and anti-viral benefits acting as an amazing immune booster. It also helps the body naturally produce collagen, which supports healthy skin and digestion. The people of Tibet have used black gojis for centuries to help with everything from cleansing the liver and kidney to enhancing blood circulation and detoxing to reducing stress as this superfood contains a variety of minerals and amino acids. All the nutrients are in the color. Due to its high level of antioxidants and water soluble polyphenols, black gojis immediately release potent streams of purple micro-nutrients when soaked in water. These nutrients help the body eliminate toxins and boost immunity, one of the reasons why Salar drink water with black gojis first thing in the morning to wake up the body. Many Salar women also drink black goji teas at night after being in the sun all day because of its anti-aging and anti-inflammatory properties. What are the best ways for us to enjoy its benefits? 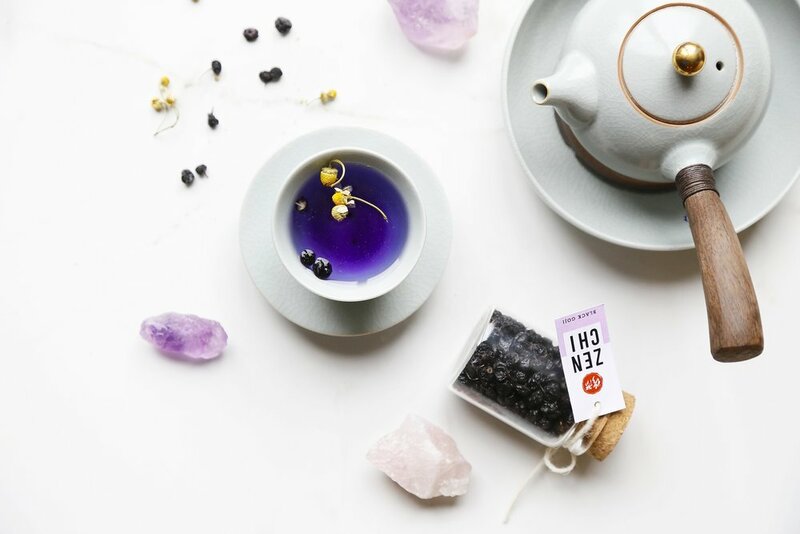 Enjoy as a hot tea or cold water infusion – the berry turns either purple or blue depending on the pH of the water, making a beautiful beverage to enjoy throughout the day!